The Gram Blue is a moderately common Lycaenid that can be found fluttering around low shrubs in open areas like the park connectors in Singapore. Where the species occurs, often several individuals can be found, chasing each other and frolicking in the sunshine. The male of the Gram Blue is a light purple-blue above whilst the female is heavily black-dusted with the wing bases a pale shining blue. 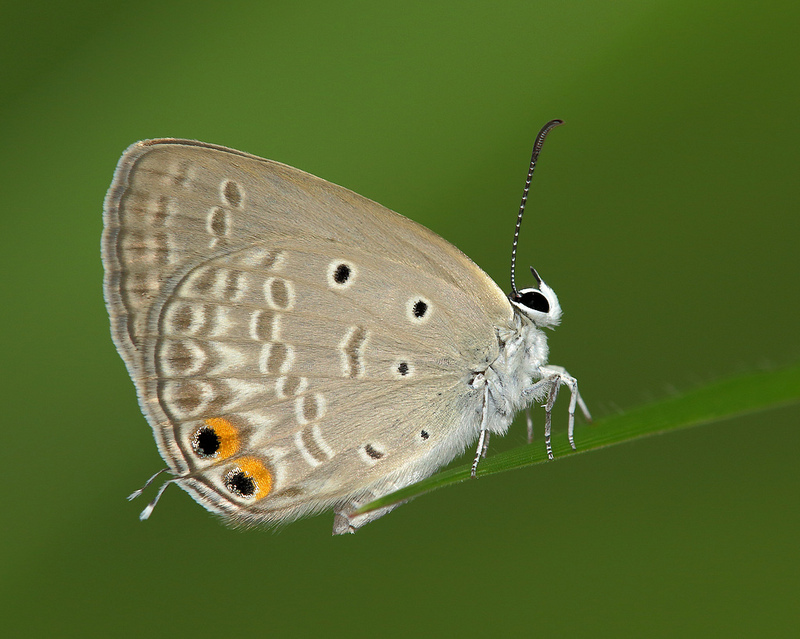 The underside is pale buff with straiae and black spots in the usual Lycaeninae arrangement. This pristine shot of a Gram Blue was taken last weekend by ButterflyCircle member Koh Cher Hern. The shot shows the butterfly perched comfortably on the edge of the leaf with its antennae neatly aligned. Good handholding technique ensures that the butterfly is sharply in focus with a deep forest green background to contrast with the lighter coloured butterfly.